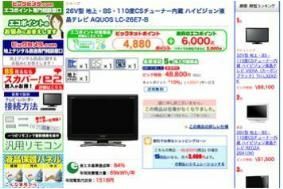 JAPAN: Flatscreen TV sales plummet overnight as eco-incentives halved | What Hi-Fi? Sales on Tuesday November 30 were running at record levels, with analysts putting November sales at 4000 mass retailers at 530% of those for the same month last. But come December 1, when the eco-points system changed, sales fell 90% overnight, and were down 40% on the same day last year. The eco-points promotion also saw exceptional demand for the two other product sectors to which it was applied: air conditioners and fridges. Sales of the former were up almost 300%, twice as many refrigerators were sold, compared to November 2009. It remains to be seen how retailers and manufacturers will cope with this lull after the sales frenzy: commentators are expecting New Year sales to start early, in a bid to keep consumers spending.